These guys are the last of a huge commission I've been doing for the past year or so. They are painted up a little better than tabletop so they can be used as a squad or broken up and used as Sergeant figures in other squads. This biggest thing I did with these guys was clean up my brush work and then blend their shoulderpads. It's a small thing, but it helps make them stand out from the other guys who just have line highlighted shoulderpads. 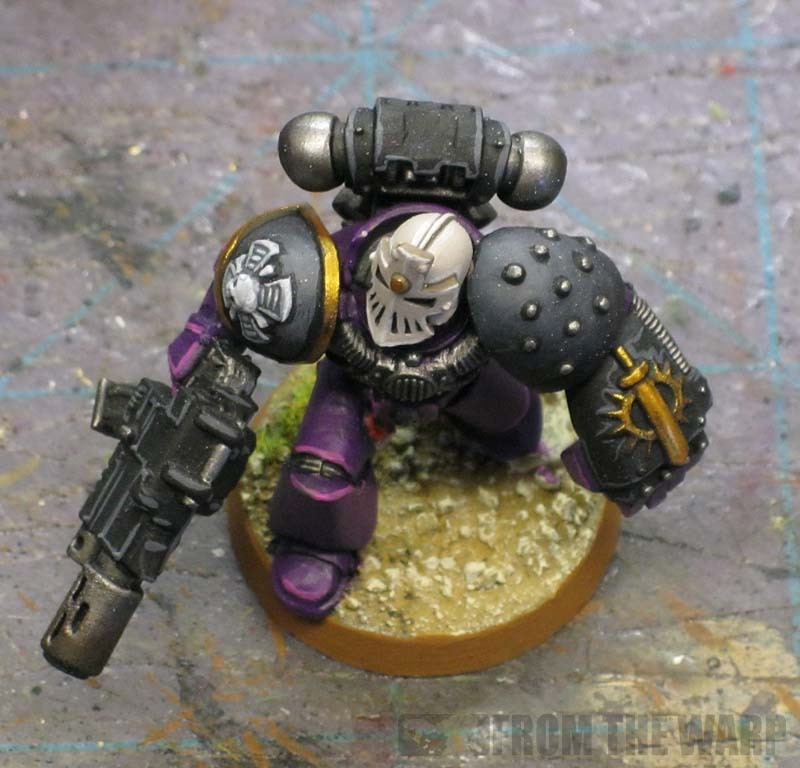 That and they have bone colored helemts which really pop against the black and purple armour. You'll have to forgive all the white specs on his shoulderpad. I hadn't noticed them there until it was too late and the squad was already packed up for mailing. It's just the fine dust from cleaning other models nearby and it's not really part of the model. In the end, purple is such a cool color for armour. You don't see it that often and it looks so sharp on the table. As a side note, this is the squad that I tried painting the base first and I liked that I didn't have to worry about drybrushing the highlights on the base with a completed model in the way. 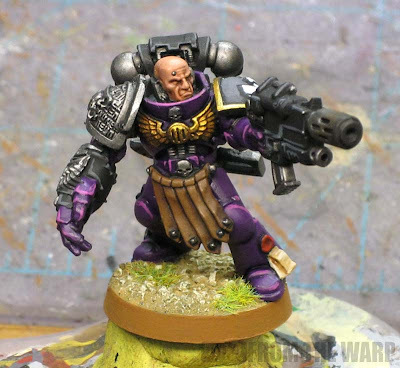 I do have a follow-up post to painting purple where I go over a quick method and a more involved one for painting purple armour on Space Marines. 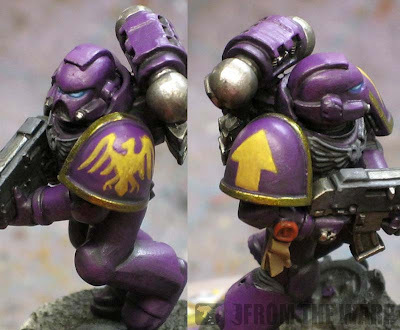 In this case it's for a Hawk Lord marine, but the purple is the same and I've included some weathering tips in there as well. You can look though the rest of the project here. That purple is so well done. I've seen many a time when purple gets highlighted a bit too much and it comes off as a dark pink. yeah, that's why I went purple, it's just such a stark contrast to just about everything else out there. Darkenedsquire: THanks, these guys are tabletop, the Hawk lord model I did came out even better I think. It's a little "darker" though overall. MC Tic Tac: Theare are nice shoulderpads and can fit a number of different "chapters" so to say. Some bits are better than others at that kind of thing. Longscope: Purple is one of those colors that when painted well looks even better on the table. Ron: I agree. I watched a game one time (I don't actually play) between a sea of bland, nearly uniform 'nids, vs a Marine force all in purple. It was a real eye opener, catchy colors just look GREAT on the table. Nice work Ron. I love the bare headed model at the top of the post. May I ask your recipe for it? They look great, is that one of the Maxmini Heads? Do you have a tutorial for the sergeants face, he looks fantastic, I always struggle qwith painting skin. They look fantastic. I wonder what color you used for the helmets? Snake88 and LittleSilverGuys: Thanks! The head is GW bit. I'll get a tutorial together this week for the skin tone. I use it all the time on my models. Dat Chu: The base color is GW Calthan Brown I think... that or Graveyard Earth. Over that is a layer of Dheneb Stone leaving the previous color showing in the recesses. On top of that is a thin line highlight of white along the prominent edges. Thanks Ron. I like its non-bright-white color quite a bit. Amazing work! Really Fantastic! Do you think purple with white a good color scheme for Space marines? Anon: Any one color with black and white will almost always work out as a color scheme. Purple is a very royal looking color and I think white would help it as well. It might be a bit harder to paint being that it's white, but it should look great on the table. 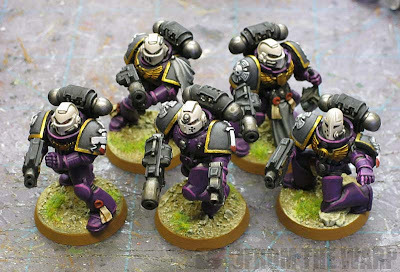 I believe it's the first time I've seen a purple color scheme that actually does look good, apart from the Emperor's Pointy Sticks, of course. Thanks! I've always enjoyed painting purple as it has such a strong presence on the tabletop. Great article. I've done almost the same thing using the helmets from the dark angels ravenwing box. Just shaved down the DA symbol on the helmet, then I had about 6 left over space marine captain backpacks(eagle head ones). Various combiweapons and power swords. Except they didn't end up as actual veterans, but a command squad. It's almost invaluable having spare bits and the customization of the marine boxsets still amazes me. relic painting: I agree, with a little creativity, you can use Space Marine bits for lots of things. Like you said, remove an icon here and there and you can re-purpose it for lots of other chapters.